Could we build it somewhere else? Mid-October 2017 the HAC Project Group announced revised engineering plans and construction methodology for building the HAC: the existing structure will be entirely dismantled and then re-built on the same site, utilising recycled material from the original building where possible. This is not as per the original plan formulated by WDC and previously approved by the Hundertwasser Non Profit Foundation (which saw some portion of the original building left in situ during construction), but was as a result of engineering consultation during the pre-tender process, prior to construction starting in early 2018. The new plans for the foundations and building structure have been completed to meet these recommendations. The footprint, floor plan, finishing and entire look and design of the building remain unchanged as per the existing 3D HAC model. The project is entirely dependent on its authenticity as the last Hundertwasser building in the world. It is this unique status that makes it so valuable as a visitor attraction and a fundable project. Hundertwasser chose that specific building to re-design in his own style. The concepts he created cannot be transferred to any other locale and still bear his name. As he is no longer with us, we cannot ask him to consider another building or locale. The intellectual property rights for the concept and original plans belong to the Hundertwasser Non-Profit Foundation (as does all copyright material belonging to the artist) and are being gifted to the people of Whangarei. The Hundertwasser Foundation recognises only the existing HWMAC plans as authentic. As protectors of his legacy, they will not allow a replica to be built or his name to be used with any other building. Even if they did, such a building would at best be only ‘in the style’ of Hundertwasser and would require completely new plans (at enormous expense), construction from the ground up (something the artist rarely undertook, preferring to ‘cure’ existing buildings) and would struggle to attract the required funding. The forecasted visitor numbers would also drastically reduce, making the entire project even less viable. If we are to have it, we are to have it there. What about the school in Auckland that recently built a Hundertwasser thing? Birkdale Intermediate School approached the Foundation and asked if there were any as-yet built Hundertwasser concepts/plans that they could use for their new entranceway. The Foundation searched their files and found a beautiful unbuilt Hundertwasser design – Pavilion For Nature – that fit the project perfectly. They not only gave their blessing for the school to use the design, they ensured it was built in the way the artist preferred and had their New Zealand representative Richard Smart consult on construction (and physically help to build it!). While there are a number of unbuilt Hundertwasser designs (he was a prolific creator) there are none remaining for a full building, anywhere in the world – except for the yet-to-be-built Hundertwasser Wairau Maori Art Gallery in Whangarei. Is the HWMAC really an authentic Hundertwasser design? Yes. Hundertwasser himself sketched plans to transform the building in 1993 when he was invited to select a Whangarei building suitable for his internationally-known architectural concepts. Hundertwasser described himself as an “architecture doctor” who “cured” buildings into becoming more in harmony with nature and the creativity of man. He condemned the straight line and the grid system. He pronounced the former Northland Harbour Board building on Whangarei’s Town Basin as ideal for an art centre. He sketched a new structure for the existing building to become a home to art, complete with shimmering tower and a usable roof garden. He stipulated that the centre would have to include Maori art to have his blessing. The building was then owned by the Northland Regional Council, which preferred to keep it in use as its offices and the initiative lapsed. Whangarei District Council bought the building in 2004 and in 2007 the Hundertwasser Art Centre proposal was revived. Council representatives travelled to Vienna to meet Hundertwasser Non Profit Foundation chair Joram Harel and seek the Foundation’s support for the construction of an art centre as envisioned by Hundertwasser. The Foundation not only agreed to the project, Joram retrieved from its extensive archive of the famous artist’s sketches and the notes, original drawings and concepts made by Hundertwasser in 1993. The Foundation persuaded out of retirement architect Heinz Springmann, who worked with Hundertwasser on architectural projects in Europe and Japan. Heinz Springmann went on to produce plans faithfully capturing Hundertwasser’s vision for the building and its functions and a scale model was built (there is a scale model for every Hundertwasser building in the world – the artist regarded the models as the best and truest plan on which to base the buildings). In June 2011 the WDC put the project in it’s Long Term Plan (LTP) but after the 2013 elections a group of councillors voted to withdraw council support for the project, despite the $5m fundraising goal having been reached. Passionate local residents and business people took up the torch and formed Prosper Northland Trust to find a way to progress the project on their own. In September 2014 council asked for submissions on what to do with the building and received 21 responses. The HWMAC was judged highest against the council’s own criteria but in a council meeting in November 2014 it was decided to take the decision to public referendum, pitching HWMAC against rival project Harbourside (a maritime museum) and potential demolition. This will be the last authentic Hundertwasser-designed building in the world, and the only public building in the Southern Hemisphere apart from the toilets at Kawakawa. The building was identified by Hundertwasser and is the only site in New Zealand the Foundation will accept for the creation of the last project to incorporate the artist’s own themes, philosophy, perspective and concerns. The Foundation will be responsible for the content and curatorial work for Hundertwasser gallery within the Centre and provide – at no cost to Whangarei or ratepayers – original artworks and circulate works between its museum in Vienna and the HWMAC. The Wairau Maori Advisory Panel has been formed to oversee the content and curation of the Wairau Maori Art Gallery. The Foundation’s co-operation is on an honorary basis – there is no fee or cost to Whangarei. The building will be, like Hundertwasser’s other works of art, a magnet for artists and tourists and for students who study his outstanding environmental art. Is it a gallery only for Hundertwasser works? Not at all. It was originally envisaged by Hundertwasser as a home to local and Maori art. Prosper Northland Trust and the Hundertwasser Non Profit Foundation in Vienna are both equally committed to the local and Māori component. The Whangarei HWMAC will help meet the aspirations of Maoridom that their art and culture take pride of place in the cultural precinct being established by the WDC, alongside other developments at the Town Basin, including the artisans’ market, Sculpture Park, Heritage Trail, Art Walk, Hatea loop and the proposed Hihiaua Culture Centre. How big will the HWMAC be? The proposed Art Centre has a total floor area of 1638 square metres – 921 on the ground floor, and 717 upstairs. The largest space downstairs is taken up by the Māori Art Gallery, some 173 square metres. Exhibition space upstairs totals 431 square metres, and there is a 166 square metre café and restaurant, plus 52 square metre terrace. Most of the building is based on the current two-storey structure, but the tower in the northeastern corner rises to a height equivalent to a five-storey building. 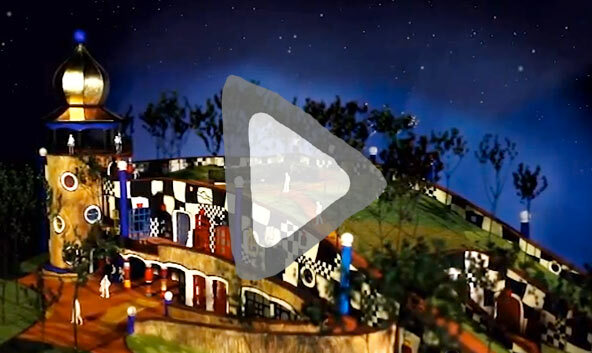 What is the 'Hundertwasser Landscape Folly'? As part of the HWMAC project, PNT will build a Hundertwasser Landscape Folly to allow people to understand the construction philosophy and techniques used on the final refurbished building. The Landscape Folly will be a small stand-alone structure, built close to the HAC (the final position is yet to be decided) before the major construction starts. It is essentially a demonstration wall – in the style of Hundertwasser – constructed to test the materials and finishes and to provide the example (for builders and craftspeople involved in the project) for the construction of the larger building. The wall’s shape is based on the “koru” (as shown on the NZ flag Hundertwasser designed in 1983) and also represented by the spiral generated by the “golden mean”. The wall itself covers an area of approx 16.5 sq m, ranging in width from 300mm at the narrowest point to approx 2.7m at the widest. The upper surface of the wall is finished with a sloping tiled surface which connects to the surrounding tiled footpath/plaza area. Beyond this surface is a 2.0 sq m planted area of roof. On the inner curve of the wall a seat is located; a resting place for 8 – 9 people at ground level, open to the harbour view. Beyond the seat, within the tight curvature of the wall, is a small covered area (under the planted roof), which will be used to demonstrate the concrete soffit finish for the main building and two tiled columns demonstrating the finish of the ceramic tiled columns for the main building. As well as its practical purpose, the Landscape Folly is an ideal way to show Town Basin visitors a visual representation of the finished building while reconstruction is underway. Informative signage about the history and status of the project will be erected in the same area. The Landscape Folly’s cost is included in the overall cost of the HWMAC refurbishment. You can see an architectural sketch of the Hundertwasser Landscape Folly here.